A fanciful self-patterning yarn in a cheerful tempting ball. 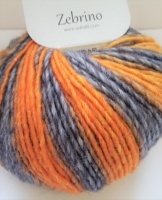 Zebrino gives the chance to everyone to knit their own striped pullover (must-have for the coming cold season) simply by working in Stocking stitch. The innovative long and regular printing merges with the mélange grey base in 9 different multicolour shades.